Strong risk appetite dominates the financial markets today. Investors are getting more optimistic on US-China trade negotiations, with another round of talks happening in Beijing now. Both sides seem to express more desire to make a deal. Trump hinted that he’s willing to let the March 1 trade truce deadline slip, even though he doesn’t prefer it. Xi will also meet US delegation later this week. Such optimism boosts Asian stocks broadly higher. In the currency markets, Yen and Dollar are the weakest ones as a result. At the time of writing, Euro is the third weakest, but Swiss Franc is not far away. Australian Dollar strengthens across the board naturally. But it’s overwhelmed by New Zealand Dollar, which was boosted by less dovish than expected RBNZ statement. For now, at least RBNZ doesn’t hint at a rate cut. Market focuses will now turn to UK and US consumer inflation data. Technically, Dollar has at least topped temporarily against European majors and Aussie. USD/JPY is also losing momentum and could also top close to 110.77 fibonacci level. With current development, some Yen crosses are now eyeing last week’s high as resistance level. NZD/JPY is looking at 75.91 and break will resume the rebound from 69.18 towards 78.86 resistance. CAD/JPY is also looking at 83.98. 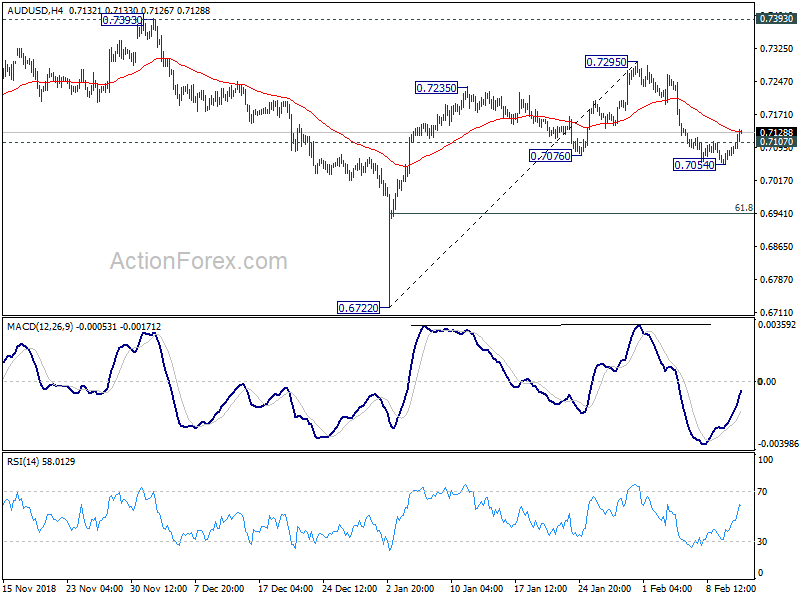 Break will resume the rebound from 76.61 to 85.17 resistance next. In Asia, Nikkei closed up 1.34%. Hong Kong HSI is up 1.20%. China Shanghai SSE is up 1.56%, back above 2700 handle. Singapore Strait Times is also up 1.21%. Japan 10-year JGB yield is up 0.0083 at -0.002, still negative. Overnight, DOW rose 1.49%. S&P 500 rose 1.29%. NASDQ rose 1.46%. 10-year yield rose 0.023 to 2.684. 30-year yield rose 0.023 to 3.022, back above 3% handle. US Treasury Secretary Steven Mnuchin is now in Beijing with Trade Representative Robert Lighthizer for trade negotiations. The high-level meeting with Chinese Vice Premier Liu He will start tomorrow. Ahead of that, Mnuchin said he hoped to have “productive meetings”, without any elaborations. Separately, it’s reported that Chinese President Xi Jinping may meet Mnuchin and Lighthizer on Friday. New Zealand Dollar jumps sharply after RBNZ turned out to be less dovish than expected. OCR was kept at 1.75% as widely expected. And, the central bank restored the language that “the direction of our next OCR move could be up or down” in the statement. However, there was no more dovish tweak. The overall statement was pretty balanced and did nothing to endorse market speculation of a rate cut by year end. Australia Westpac consumer confidence rose 4.3% in February. Japan domestic CGPI rose 0.6% yoy in January versus expectation of 1.0% yoy. Inflation data will be the major focuses of today. UK will release CPI, PPI and house price index. Eurozone will release industrial production. US will release CPI too. In particular, headline CPI in US is expected to slow sharply from 1.9% yoy to 1.5% yoy in January. 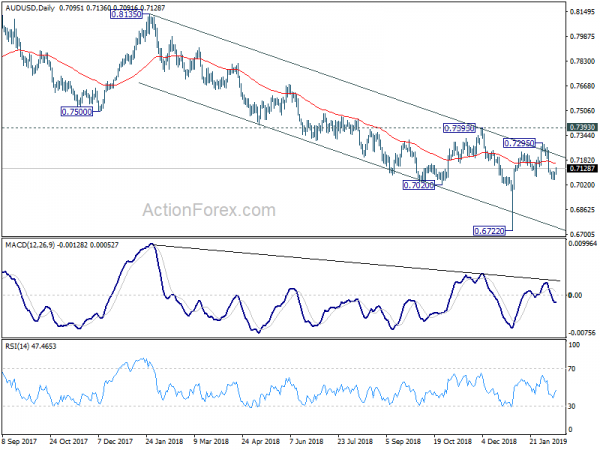 AUD/USD’s strong recovery and break of 0.7107 minor resistance suggests temporary bottoming at 0.7054. Intraday bias is turned neutral for consolidations. Stronger rise might be seen, but upside should be limited by 0.7295 resistance to bring another fall. We’re holding on to the view that rebound from 0.6722 has completed at 0.7295 already. On the downside, break of 0.7054 will turn bias to the downside for 61.8% retracement of 0.6722 to 0.7295 at 0.6941 next.